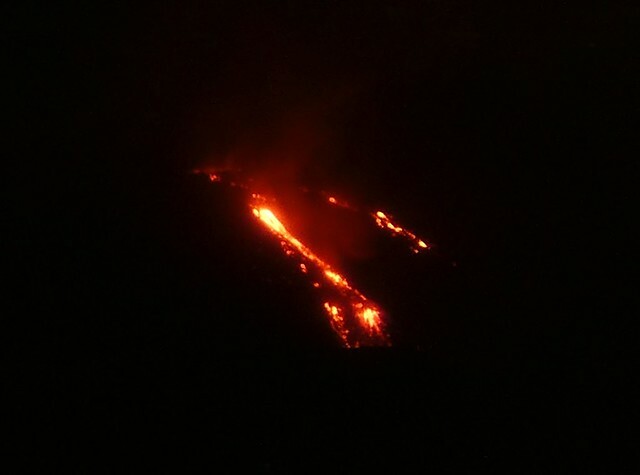 On March 17th, 10 people got injured while watching the flowing lava, amongst them a BBC film crew. Red-hot lava had flowed onto snow or ice and the sudden cooling precipitated an explosion, which covered people in boiling rocks of varying sizes. We hear more details from a tour guide some days later who, typically for local folks, talks of the volcano as of a person. There were two smaller explosions first. 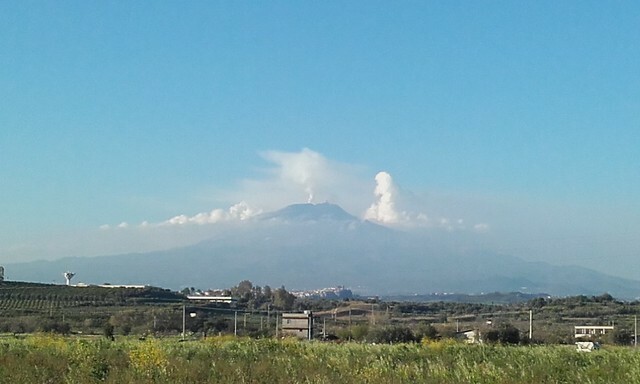 Twice mother Etna said ‘go, leave!’ but the people didn’t react, so then the third time they got caught in a big explosion. They were too close to the lava and no-one had helmets on! Nevertheless, Frank is very keen to get a bit closer to the action, so one late afternoon, we take the winding road up to the southern slopes. As our Emma is carrying us slowly but steadily up, 18 km through lunar landscapes, I’m thinking how crazy are we, going up an active volcano, look around you Ruth, there’s lava all around you here, and who’s to say that the explosion now is not suddenly going to be as big as the one that brought all the lava that is visible around me? I feel out of my comfort zone, also about the thought of spending the night on a mountain that is practically alive just under the surface, bubbling away with a ferocious energy. But then I remind myself that I like to move out of my comfort zone every now and then, so I say nothing about it as we wind our way up and up. When we arrive, the funicular at Rifugio Sapienza is closed. 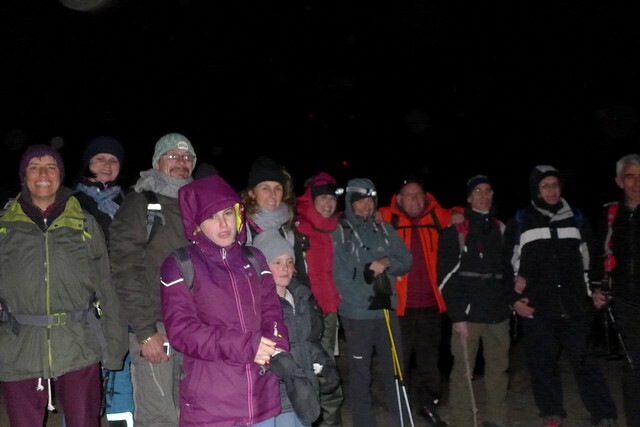 While we amble around the deserted car park, a group of about 20 people arrive and get ready for a night time hike. It turns out they are heading up the mountain to see the lava. A quick look at the group (age range from under 10 to over 60, one person without hiking boots – we think we can keep up with them) gives us the courage to ask if we could join them. It is about 8pm by the time we start walking up the hill into the dusky landscape. 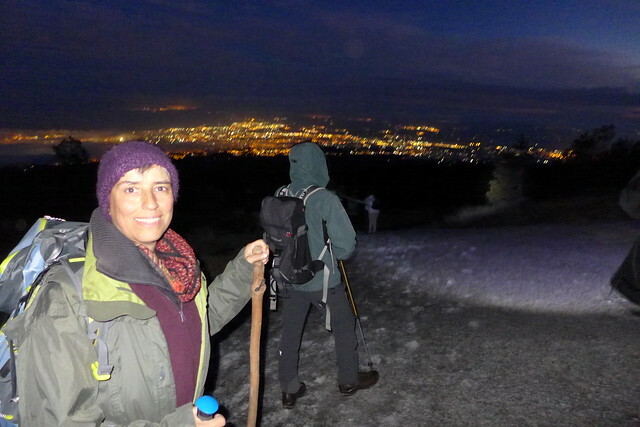 It turns out they are an alpine hiking group, based in Syracusa, who meet every Sunday to tackle some slope or other, so they are all well trained! We soon lose the one person without adequate shoes (she turns back home after about 1km), but we feel we want to stick it out. Soon we have to stop chatting to people, because we need all our attention and energy just to keep up with them as they scramble up the steeply ascending path, across snow and ice, like a herd of mountain goats! When we reach the first plateau, I’m gasping for air, regretting having drunk a pint of water just before leaving, thus causing me a side stitch. The world is not as steady as it normally is; everything is slightly spinning around me in the thin mountain air and Frank’s legs look like they are made of rubber. Luckily the heard of goats slow down on the flat and are now leisurely strolling towards the next incline. Meanwhile it’s getting quite dark too, so we really need to stay with them as we don’t have any lights with us. How much further are they going to chase up the mountain??? There is no turning back now, we wouldn’t know or see the way! But the view compensates for all troubling thoughts: Catania spreads out below us, a thousand lights shimmering in the distance like sparkling jewels. After another steep (and equally fast) incline and another leisurely stroll across a windy plane, we head around the corner and the view opens into the Valle dei Bovi. Here we can see the lava flow, although not as much as when I saw it from the airplane. 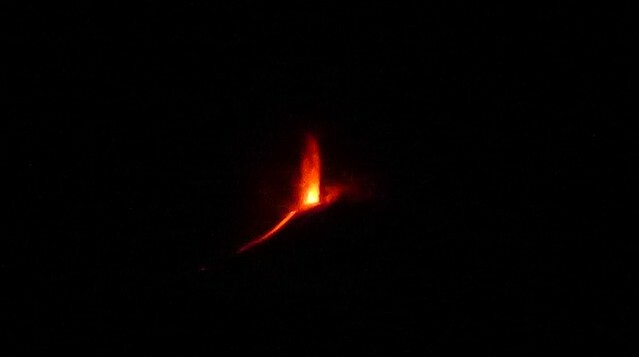 But nevertheless, we are now within about 800 metres of flowing lava and it feels awesome! There is no snow here, so we are safe from the aforementioned explosions. Here’s a photo of the group. If you look closely you might see a red dot above the heads of the people in the middle. That’s the Lava! It is very cold and windy though, so quite soon, we turn round and everyone scrambles back down the hill. At 9.15pm, we reach the road again. I think if Frank and I had done that tour on our own, we wouldn’t have been back before midnight! This hike was way out of both our comfort zones. We are absolutely knackered, barely standing straight and not quite sure what has hit us. But it was worth it! Sadly the photographs don’t give the full effect.